After a corrected Hi-C matrix is created other tools can be used to visualize it, call TADS or compare it with other matrices. Below are the links to the read files that can be copied and pasted in the upload manager. Rename the data set to something meaningful, e.g. HiC_S2_1p_10min_lowU_R1 and HiC_S2_1p_10min_lowU_R2. By default, when data is imported via its link, Galaxy names it with its URL. HiCExplorer needs as input the forward and reverse strand of a pair end read which are mapped independently. A usual start point for a typical analysis is the given GSE number of a publication, e.g. GSE63525 for Rao 2014. To get the actual data, go to NCBI and search for the GSE number. In the section ‘Samples’ the GSM numbers of all samples are given. Select the correct one for you, and go to the European Nucleotide Archive and enter the GSM number. Select a matching result e.g. SRX764936 and download the data given in the row ‘FASTQ files (FTP)’ the forward and reverse strand. It is important to have the forward and reverse strand individual as a FASTQ file and to map it individually, HiCExplorer can not work with interleaved files. Mates have to be mapped individually to avoid mapper specific heuristics designed for standard paired-end libraries. tune the aligner parameters to penalize deletions and insertions. This is important to avoid aligned reads with gaps if they happen to be chimeric. If bowtie2 or hisat2 are used, --reorder option and as a file format bam_native needs to be used. Regular bam files are sorted by Galaxy and can not be used as an input for HiCExplorer. Once the reads have been mapped the Hi-C matrix can be built. For this step we will use hicBuildMatrix tool, which builds the matrix of read counts over the bins in the genome, considering the sites around the given restriction site. hicBuildMatrix creates two files, a bam file containing only the valid Hi-C read pairs and a matrix containing the Hi-C contacts at the given resolution. The bam file is useful to check the quality of the Hi-C library on the genome browser. A good Hi-C library should contain piles of reads near the restriction fragment sites. In the QC folder a html file is saved with plots containing useful information for the quality control of the Hi-C sample like the number of valid pairs, duplicated pairs, self-ligations etc. Usually, only 25%-40% of the reads are valid and used to build the Hi-C matrix mostly because of the reads that are on repetitive regions that need to be discarded. Normally 25% of the total reads are selected. The output matrices have counts for the genomic regions. The extension of output matrix files is .h5. A quality report is created in e.g. hicMatrix/R1_10kb_QC, have a look at the report hicQC.html. Rename the output to 10 kb contact matrix. A 10kb bin matrix is too large to plot, it’s better to reduce the resolution. We usually run out of memory for a 1 kb or a 10 kb bin matrix and the time to plot it is very long (minutes instead of seconds). In order to reduce the resolution we use the tool hicMergeMatrixBins. Rename the output to 1 MB contact matrix. Because of the large differences in counts found in the matrix, it is better to plot the counts using the –log1p option. hicCorrectMatrix corrects the matrix counts in an iterative manner. For correcting the matrix, it’s important to remove the unassembled scaffolds (e.g. NT_) and keep only chromosomes, as scaffolds create problems with matrix correction. Therefore we use the chromosome names (chr2R, chr2L, chr3R, chr3L, chrX) here. Matrix correction works in two steps: first a histogram containing the sum of contact per bin (row sum) is produced. This plot needs to be inspected to decide the best threshold for removing bins with lower number of reads. The second steps removes the low scoring bins and does the correction. The output of the program prints a threshold suggestion that is usually accurate but is better to revise the histogram plot. The threshold is visualized in the plot as a black vertical line. In our case the distribution describes the counts per bin of a genomic distance. To remove all bins with a z-score threshold less / more than X means to remove all bins which have less / more counts than X of mean of their specific distribution in units of the standard deviation. Looking at the distribution, we can select the value of -1.6 (lower end) and 1.8 (upper end) to remove. This is given by the –filterThreshold option in hicCorrectMatrix set to ‘correct matrix’ mode. Rename the corrected matrix to 10 kb corrected contact matrix. ERROR:iterative correction:*Error* matrix correction produced extremely large values. This is often caused by bins of low counts. Use a more stringent filtering of bins. This can be solved by a more stringent z-score values for the filter threshold or by a look at the plotted matrix. For example, chromosomes with 0 reads in its bins can be excluded from the correction by not defining it for the set of chromosomes that should be corrected (parameter ‘Include chromosomes’). 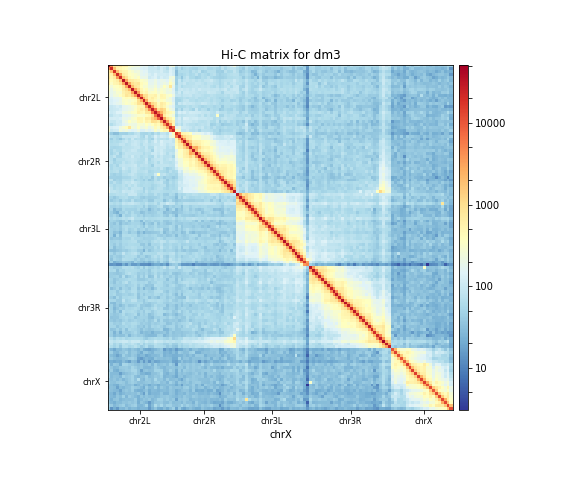 We can now plot chromosome 2L with the corrected matrix. The steps so far would have led to long run times if real data would have been used. We therefore prepared a new matrix for you, corrected contact matrix dm3 large. Please load it into your history. “The partitioning of chromosomes into topologically associating domains (TADs) is an emerging concept that is reshaping our understanding of gene regulation in the context of physical organization of the genome” Ramirez et al. 2017. TAD calling works in two steps: First HiCExplorer computes a TAD-separation score based on a z-score matrix for all bins. Then those bins having a local minimum of the TAD-separation score are evaluated with respect to the surrounding bins to assign a p-value. Then a cutoff is applied to select the bins more likely to be TAD boundaries. hicFindTADs tries to identify sensible parameters but those can be change to identify more stringent set of boundaries. As an output we get the boundaries, domains and scores separated files. We will use in the plot later only the TAD-score file. We can plot the TADs for a given chromosomal region. For this we will use hicPlotTADs. For the next step we need additional data tracks. Please load dm3_genes.bed, H3K27me3.bw, H3K36me3.bw and H4K16ac.bw to your history. In this tutorial we used HiCExplorer to analyze drosophila melanogaster cells. We mapped the chimeric reads and created a contact matrix, to reduce noise this contact matrix was normalized. We showed how to visualize a contact matrix and how we can investigate topological associating domains and relate them to additional data like gene tracks. To improve your learned skills we offer an additional tutorial based on mouse stem cells: following work. Hi-C helps to investigate the 3D structure of the genome and to uncover folding principles of chromatin. In order to build a Hi-C contact matrix the reads have to be mapped to the reference genome. Based on a contact matrix open and closed chromatin (A/B compartments) and topological associating domains (TADs) can be computed. This material is the result of a collaborative work. Thanks to the Galaxy Training Network and all the contributors ( Joachim Wolff, Fidel Ramirez, Vivek Bhardwaj, Ekaterina Polkh)!